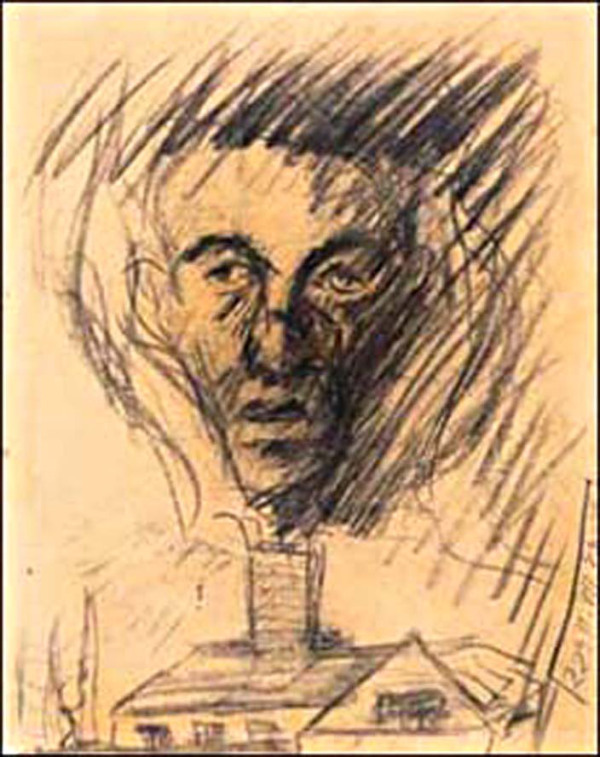 Yehuda Bacon says he drew this ‘portrait’ of his father going up in smoke at Auschwitz when he was 16 years old. 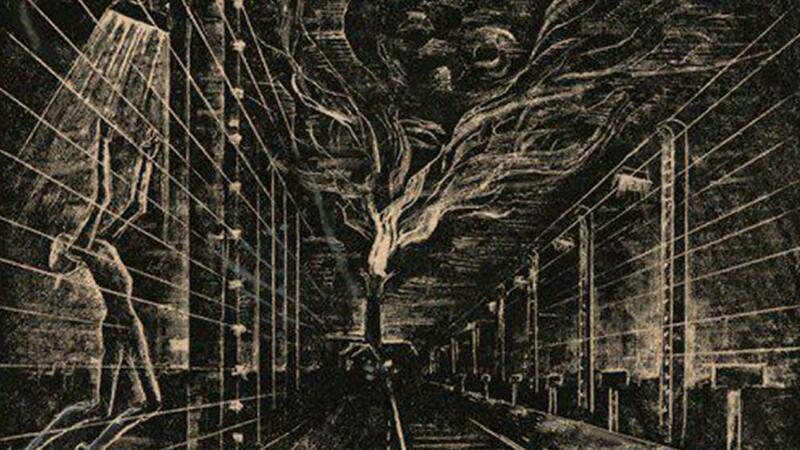 He became an artist and teacher, known for his fantastical holocaust images. 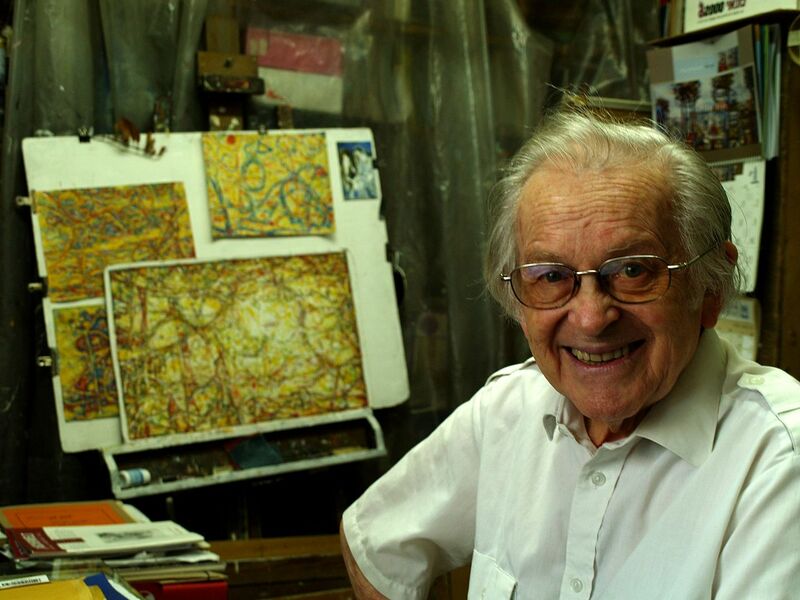 Bild, Germany’s most popular tabloid, has reported on a new memoir by yet another holocaust surlievor, the “world-famous” artist Yehuda Bacon (not be be confused with Yehuda Bauer of Yad Vashem). Yes, Bacon is the surname of this Orthodox Jewish man, apparently honestly come by in case you’re thinking it’s a bad joke. 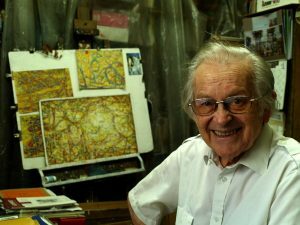 The elderly Yehuda Bacon in his studio in Jerusalem in August 2008 with some of his “world famous art” inspired by the Holocaust. Bild informs us the memoir is comprised of a series of conversations between psychologist and author Dr. Manfred Lütz and the the subject. That means Bacon is not capable of writing it himself. A part was previewed in Bild, and that inspired a hack writer to produce the sensationalized article that appeared in the Daily Mail Online. The Daily Mail is a British tabloid, pretty much the equivalent of Bild in Germany. Holocaust stories are fodder for tabloids – they love and can’t get enough of them. I’ll start with the Daily Mail – to keep you reading, because there is a lot more to this story. Their headline was “Mengele WHISTLED Mozart as he selected victims for gas chambers, reveals survivor.” Cute, huh? I’m not sure we’ve heard that one before. Would this 15 year-old even recognize a Mozart melody, let along be always around when Dr. Josef Mengele was going through the alleged selection process, which supposedly took place often and in various places around the camp? In fact, we are to believe this 15 year old had such a close relationship with this Nazi that he even knew why Mengele whistled. He was bored. I was more than skeptical of this, but I did find that Bacon may have been one of the teenagers who later dubbed themselves the “Boys of Birkenau” —orphaned boys who allegedly persuaded Dr. Mengele to add them to the “able to work” list. There will be more about this later, showing that Yehuda’s connection with Mengele may possibly have existed, but was limited. Would he know Mengele’s moods and habits? I’m sure not. But in order to boost his bonafides, Bacon also said of Mengele: “He was always correct, he never beat us children” —slyly implying that others did, or that the doctor might have beat adults. In reality, Mengele was a very kind man whose role at Auschwitz truly was to keep the camp and the people in it free of disease. He did not make all the ‘selections’ that suvlievors attribute to him. Turning to the Bild article, they actually write that the 15-year-old Bacon “toiled in the crematoria of Auschwitz.” What? That’s the same thing Bild wrote about Joshua Kaufman! Nonsense, and shame on Bild (though they have no shame). There is nothing said about that in the portion of the interview Bild published. I copy only a couple excerpts. 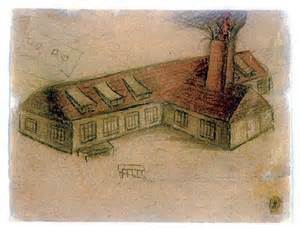 A Yehuda Bacon drawing: Flames pouring out of the crematorium chimney at night, a naked person electrocuted at the fence, and railroad tracks — all standard symbols of the Jewish Holocaust story that have no basis in fact. Manfred Lütz: How was the end in Auschwitz? Jehuda Bacon: On night of January 18, 1945 we had to take everyone who was left there. Some tried to hide, because it was clear: This is the end. Now the Russians are coming. We heard the guns from a distance. All had to join in … we even got a loaf of bread for the way and we waited until all were there. Then we went out. That I still clearly remember, and exactly as we marched off, the crematoria were blown up. We could still hear these sounds and saw it too. Then we went two or three nights without a break until the Blechhammer camp. Lütz: That was almost 100 kilometers, day and night, without sleep? Bacon: Day and night without sleep. This is very hard. If you do not eat, if you do not sleep, when it’s so cold, if there is a lot of snow, then one becomes weaker with time. And that is a fight for survival. It’s hard to describe such a fight. But you can, if you have to. Bacon: Yes. Mauthausen was actually an entirely different stock, it was originally intended for political prisoners. But now it was already half messy here. The remains of Auschwitz came to Mauthausen, but also Hungarian Jews, even from a good background, women with fur coats and all. I saw the Hungarians who arrived and were still dressed beautifully with rings that had not yet been taken. They gave a ring for a glass of water, so thirsty were they. And a picture that I can not forget: There was a trolley on which containers were transported (vessels in which one normally collected waste), and it was a soup, really just water with maybe two potatoes. And now this trolley drives along and it shakes a bit, so this water-soup spills out and the drops flow together with all the dirt in the corner of the trolley. And so a prisoner comes with a small vessel and succeeds in collecting these few drops. And since an SS man sees it and thinks it is stealing, he takes him and shoots him before a pit. Bacon also claims the bread was poisoned by the SS, but for what reason I could never figure out. This is the quality of Yehuda Bacon’s “memoir.” Who is this man, Yehuda Bacon? Yehuda Bacon personifies the show-biz and easy life of holocaust survivorship, living as a “highly praised artist” even though he has no talent and his paintings and drawings are devoid of any artistic merit. 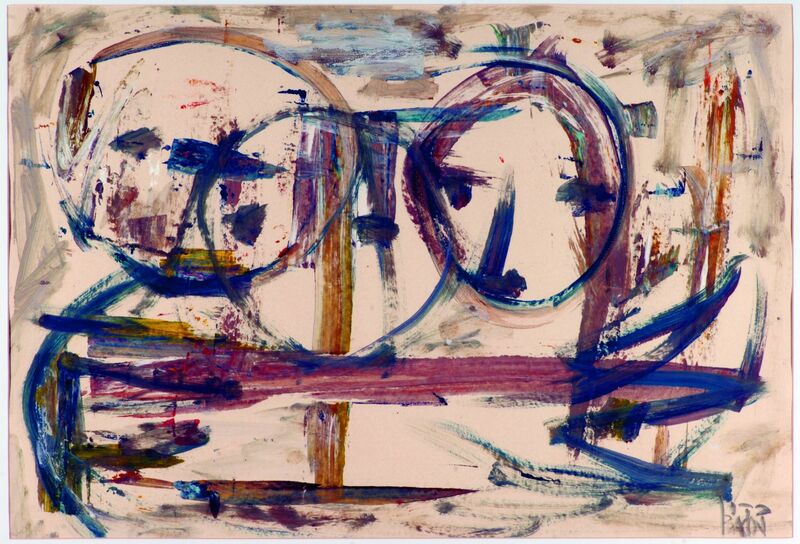 Because he was “in the camps” in his youth, he has been able to tell tall tales about what he saw and experienced there, drawing and painting images of “horror” that occurred only in his imagination – afterwards. Yehuda was born into a Hasidic (Orthodox) family living in the city of Ostrava (Czechoslovakia) in July 1929 – making him 10 months younger than Elie Wiesel, also born into a Hasidic family. Bacon is now 87. Though he has been well-known since 1945, details about his family are missing. His parents are never named, only his sister is given a name—Hanna. Was their surname really Bacon? That isn’t a Czech or Jewish name; it’s actually, as far as I can discover, Germanic-Norman-English, so one wonders what the family name really was and how he came to use Bacon. His family was sent to the Ghetto Theresienstadt in the fall of 1942 when Yehuda was 13 years old. It was a town southeast of Brno in Moravia that the Germans turned into an experimental “model Jewish settlement” for educated and accomplished Jews. Because of the pleasant living conditions and many cultural activities, holocaust propagandists have invented terrible things that purportedly went on there. A film titled “Terezin: A Documentary Film of the Jewish Resettlement” (translated) was made by the National Socialists showing a comfortable existence within a thriving cultural centre, but most of the film was destroyed after the war. What does that tell you? In early July 1944 there was made a decision about a selection in the camp, which in fact meant liquidation of the family camp. Only 3,500 of the present men and women were then recognized as able-to-work and left that place of death. The rest of the prisoners – old, ill and mothers with children – were to face gas chambers [more of the myth]. 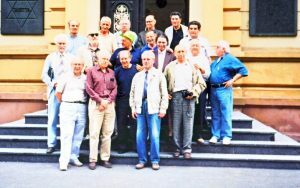 Some of the “Birkenau Boys” gather for a reunion in Terezin – the former Theresienstadt ghetto. Is that Yehuda Bacon in the middle front? 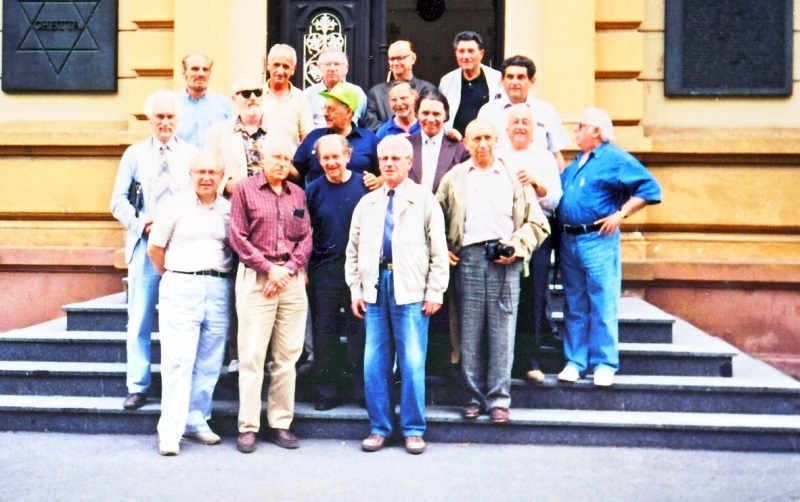 The boys were placed in the men’s camp in Block 13, known as a criminal block. The prisoners there – Poles, Germans, Russians – were under a tightened regime and got harder work. Czech boys drew attention there, however the block supervisor did not limit their activities much; they played football or sang together Czech songs. […] Their days were mostly filled up with work – they helped in the kitchen, brought from outside [the camp?] things needed to repair roads or heat houses. Some of them even worked outside the camp. After a few weeks a selected group of “able” boys was sent to work in the Reich. But not Yehuda – he remained until the evacuation. He was probably small and slight, and maybe in some other ways not fit. His father, mother and sister, being capable of work, were sent to other camps to work in the vital munitions factories. On Bacon’s Wikipedia page, it says he “saw his father murdered in the gas chambers.” This, of course, is the type of big, fat lie he’s always told. 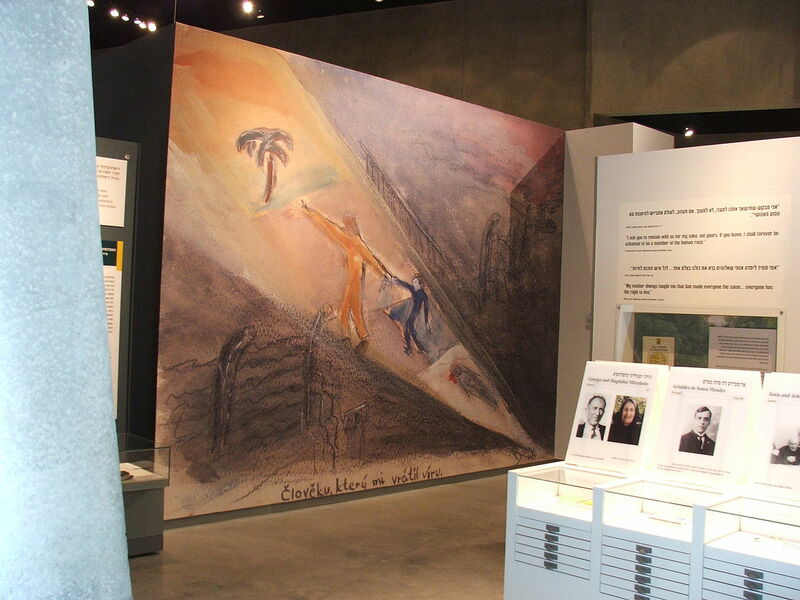 The mystical, magical, miraculous nature of surlievor tales is epitomized in this greatly enlarged reproduction of a much smaller Bacon painting installed in the Yad Vashem museum in Jerusalem. The primitive style is that of a self-taught amateur. To cover for his lack of any talent for his chosen profession, things like this are written about his work. His Œuvre consists of a synergistic interaction: on the one hand, Bacon processes the experiences of his childhood and youth in the concentration camps, on the other he is searching for a way of understanding through his art. Such is the way Jewish critics cover for bad Jewish art, but Bacon is particularly only a holocaust promoter, creating primitive and ridiculous depictions of fantasy. Most of his ‘works’ are very small, too; most are measured in centimeters. 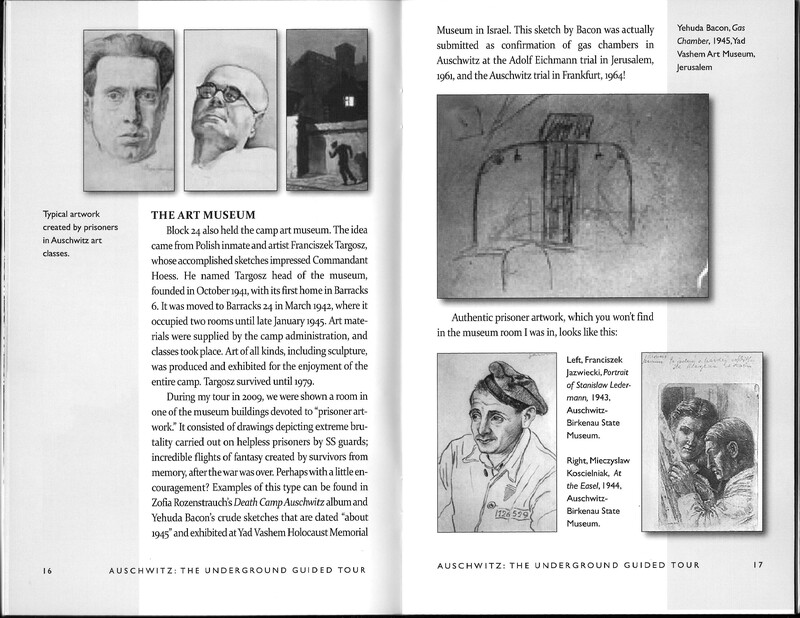 Of special interest, he is the one who drew the “gas chamber” interior that I reproduced in my book Auschwitz: The Underground Guided Tour. These meaningless lines cannot be from memory, but he was told what it was supposed to contain. What a fraud. You can see more of Bacon’s Œuvre here. Typical Jewish art by Yehuda Bacon.